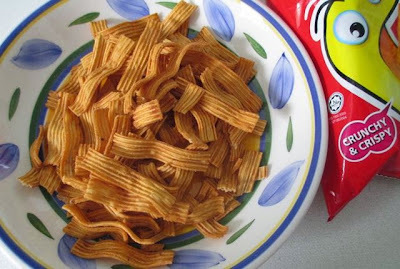 On opening the packet you'll see from the photograph that these wheat snacks looked like long slimline bacon fries. I can agree that they were indeed crispy and crunchy, although not super hot in the chilli stakes they did have a mild kick with their spicy flavour. 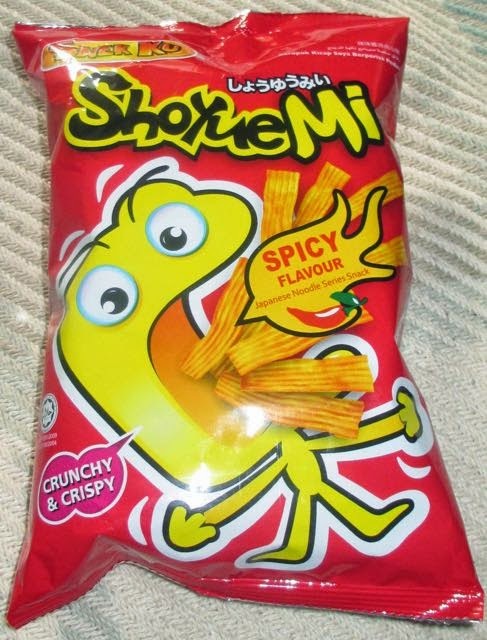 The fat chilli and flame coming out of the guy's big mouth on the front of the packet was a slight exaggeration, however the sweet chilli aftertaste left my mouth tingling. Very difficult to stop eating once I'd started on the bowl I have a feeling these sweet, tangy and spicy chilli wheat strips will find their way back on my lunch menu in the future. If you like the feel of your bacon fries I'd recommend you give these a try, as they might not taste of bacon in any way, but I'm suspecting if you like a spicy alternative I doubt you'll care! SNEK KU In produced by New Star Food Industries in Malaysia. 60g bag at 100g contains 481 calories, with 20g of fat and 30g of sugar. Ingredients included; wheat flour (70%), palm oil, modified tapioca starch, soy sauce (soy beans, wheat flour, salt), chilli (2.5%), basil yeast, sugar, salt, hydrolysed vegetable (soy) protein, flavour enhancer E621 (which is Monosodiumglutamate (MSG)). Contains wheat and soy, and was prepared in a factory that handles milk, crustaceans, fish, peanuts, tree nuts, egg, sesame and sulphites.